Counting animals to estimate their population sizes is often essential for their management and conservation. Since practitioners frequently rely on indirect observations of animals, it is important to better understand the relationship between such indirect indices and animal abundance. The Formozov-Malyshev-Pereleshin (FMP) formula provides a theoretical foundation for understanding the relationship between animal track counts and the true density of species. Although this analytical method potentially has universal applicability wherever animals are readily detectable by their tracks, it has long been unique to Russia and remains widely underappreciated. 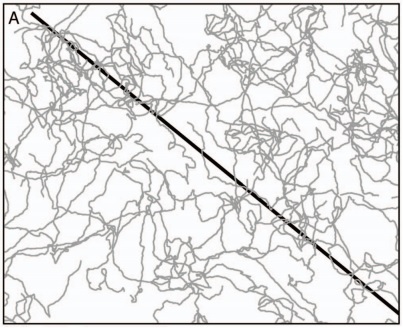 In this paper, we provide a test of the FMP formula by isolating the influence of animal travel path tortuosity (i.e., convolutedness) on track counts. We employed simulations using virtual and empirical data, in addition to a field test comparing FMP estimates with independent estimates from line transect distance sampling. We verify that track counts (total intersections between animals and transects) are determined entirely by density and daily movement distances. Hence, the FMP estimator is theoretically robust against potential biases from specific shapes or patterns of animal movement paths if transects are randomly situated with respect to those movements (i.e., the transects do not influence animals’ movements). However, detectability (the detection probability of individual animals) is not determined simply by daily travel distance but also by tortuosity, so ensuring that all intersections with transects are counted regardless of the number of individual animals that made them becomes critical for an accurate density estimate. Additionally, although tortuosity has no bearing on mean track encounter rates, it does affect encounter rate variance and therefore estimate precision. We discuss how these fundamental principles made explicit by the FMP formula have widespread implications for methods of assessing animal abundance that rely on indirect observations. This entry was posted in 4 The Art of Tracking, 6 Conservation and tagged Track Counts on 2014/05/27 by Louis Liebenberg.